LAS VEGAS - Yesterday (Sunday, May 29), Las Vegas celebrated the launch of its official Snapchat channel (@VisitLasVegas) by presenting the “King of Snapchat,” DJ Khaled with a key to the Strip during a special ceremony at The Venetian® Las Vegas. 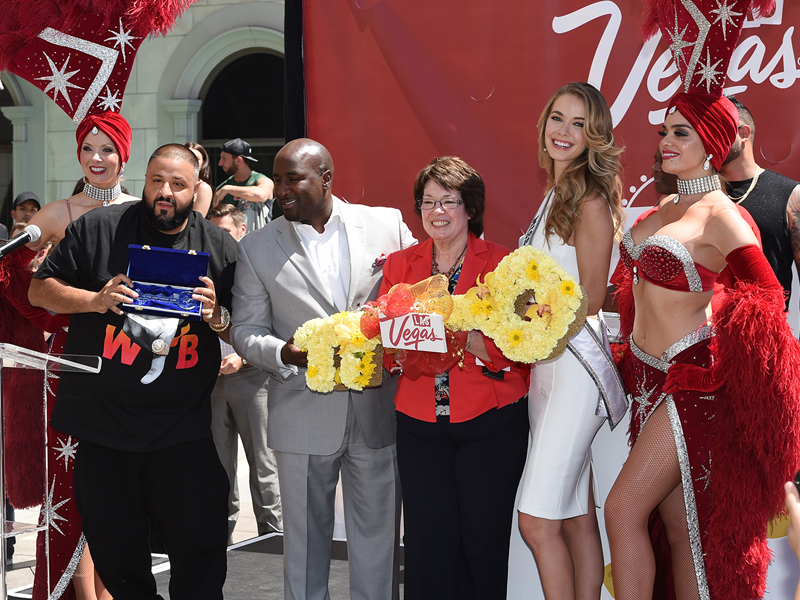 Showing their “fan luv,” hundreds of DJ Khaled’s supporters watched as Las Vegas Convention and Visitors Authority (LVCVA) board member and Las Vegas City Councilman Ricki Barlow welcomed the music mogul to the destination before Clark County Commissioner Mary Beth Scow, with the help of Miss USA Olivia Jordan, presented DJ Khaled with the official key to the Las Vegas Strip. Following the presentation, DJ Khaled treated the audience to several of his iconic keys to success as well as an electrifying performance of his hit, “All I Do Is Win.” As part of the partnership with Las Vegas, Khaled took over the destination’s Snapchat account, snapping and sharing his personal Vegas story throughout the day. Followers were taken on a journey through the Entertainment Capital of the World as he experienced some of Las Vegas’ most exclusive and unique offerings, including a gondola ride at The Venetian, a relaxing massage, manicure and pedicure at Canyon Ranch SpaClub inside The Palazzo Las Vegas; enjoying breathtaking views of the Strip from a luxurious suite at The Cosmopolitan of Las Vegas; as well as making a visit to the iconic “Welcome to Las Vegas” sign. Gaining nearly 10,000 views in its first day, the Las Vegas Snapchat channel will capture unforgettable destination experiences, including culinary, nightlife, entertainment and much more. Las Vegas fans can also follow the Entertainment Capital of the World on Facebook, Twitter, Instagram and YouTube.